As the world awaits Windows 8 and Windows RT tablets (such as Microsoft Surface), here’s a twist: Samsung’s Series 7 Slate tablets (actually called Slate PC) running Windows 7 are selling well and the company has had trouble keeping up with demand, according to a briefing at Microsoft Worldwide Partner Conference 2012 (WPC12). Hey, we’re not talking Apple iPad sales rates but Samsung appears to be carving a Windows 7 tablet niche in health care, education, financial services and other vertical markets. Samsung has an interesting mix of Windows, Google Android and Google Chrome OS hardware — positioning the company well for VARs that want flexible choices for smartphones, tablets and cloud-oriented solutions. The VAR Guy has spent recent days using the Samsung Series 7 Slate PC (on loan from Samsung) and yes, it works as advertised. Samsung’s Series 7 Slates were originally positioned as consumers device, “but it got adopted in business,” said Brian Nowlin, a senior product marketing manager at Samsung. The reason: It works well in networked Windows environments, and offers the flexibility of content creation and content consumption. “The price point is a little higher but there’s no degradation of performance,” he said. Of course, it’s important to keep this blog entry in context. Apple is expected to sell about 21 million iPads in Q3 2012. In stark contrast, The VAR Guy suspects Samsung’s Windows tablet sales involve tens of thousands or hundreds of thousands of units (that’s just a hunch). 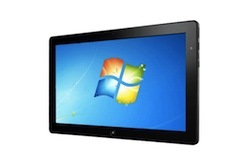 That said, the Windows 7-based tablets are going into business. Now, The VAR Guy is working to find out where the deployments are occurring. The answer to that question will involve a long-term dialog with Nowlin and Samsung. Stay tuned.